(From Sony lens literature) Get incredibly close to small subjects with the Sony SAL-50M28 macro lens. It allows you to easily capture the most subtle details with spectacular clarity. A compact macro-focus lens that covers the full range from life-size to infinity. "Life size" macro imaging means that the image you capture is the same size as the subject in reality -- giving you spectacularly sharp photos of insects, flowers, gemstones, postage stamps and other small nature subjects and collectibles. 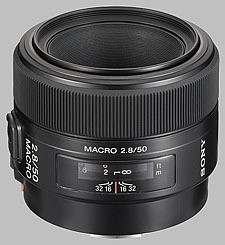 Mounted on the Sony a (alpha) DSLR-A100 camera, this lens provides a 75mm focal length (35mm equivalent) -- which means it can also be used as a standard and midrange telephoto lens. Sharp Macro Focusing: You can get closer to your subject to capture low-angle shots of insects, flowers and other natural wonders -- and broad depth of field lets you keep backgrounds in focus too. Bright f/2.8 Aperture: In conjunction with the Super SteadyShot image stabilization system of the Sony a (alpha) DSLR-A100 camera, this lens captures bright, steady images even working with hand-held camera in low light. High Contrast and Resolution: Excellent optical precision gives your shots greater visual accuracy for close analysis of your subject. Focus Range Limiter: Speeds auto-focus response by limiting the range of distances that are brought into focus -- Close-up Range, or Telephoto Range. Focus Hold Button: For full creative control, a focus hold button located on the lens can lock auto-focusing. Auto Clutch: In auto-focus mode, the manual focus ring does not rotate -- which improves handling ease. Circular Aperture: Because aperture blades form a near circle at the wide openings used for low-light shots, spot-light sources have a pleasing circular defocused effect. The macro lens is possibly the lens most often acquired for the wrong reason: for close up work picturing flowers and small things. This is just half the ability of this type of lens; the prime design concern is to provide a flat field and very little distortion, none of these features are particularly important for close up work. Today close-ups are easily taken with a good compact digital camera, probably costing less than the macro lens alone. The compact camera has a wide angle focal length of about 1/10 of the classical macro lens, making them particularly suitable for photographing small things like insects, flowers and toy models. Recieved my A100 over a week ago, and this lens a few days ago. Have put almost 800 shots thru it from landscapes to extremely close macro shots. Terribly impressed with it, worth every penny. Focus hold and limiter are great additions to it, and makes the A100 all business. I could shoot with this lens all day and night and never tire using it. Great for portraits too. Shots come out tack sharp, no visible disortion or CA whatsoever. Prime lens fan now. Love it!